From: Stone, P, Millward, D, Young, B, Merritt, J W, Clarke, S M, McCormac, M and Lawrence, D J D. 2010. British regional geology: Northern England. Fifth edition. Keyworth, Nottingham: British Geological Survey. 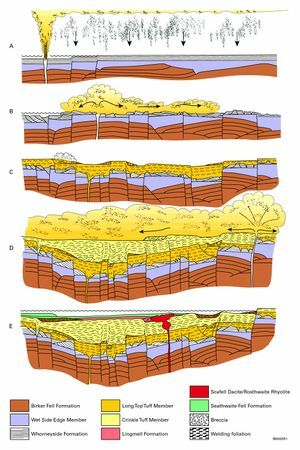 Generalised stratigraphy of the succession at the Scafell Caldera volcano, with details of the explosive, caldera-collapse phase and overlying caldera lake infill sequence. P916049. (opposite) Schematic cross-sections showing development of the Scafell Caldera during piecemeal collapse. The sequence of events is greatly simplified (after Branney and Kokelaar, 1994). A Emplacement of the Whorneyside Formation ignimbrite and succeeding phreatoplinian ash. B Onset of piecemeal subsidence causing deformation of the Whorneyside deposits; burial beneath hot silicic ash of the Long Top Tuffs erupted from new vents. C Further collapse causing ductile deformation of the hot ignimbrite. D Paroxysmal eruptions producing very densely welded ignimbrites of the Crinkle Tuffs and causing renewed subsidence and fault-scarp collapse.E Waning eruptions and silicic dome emplacement; sedimentation in a caldera lake. P916050. 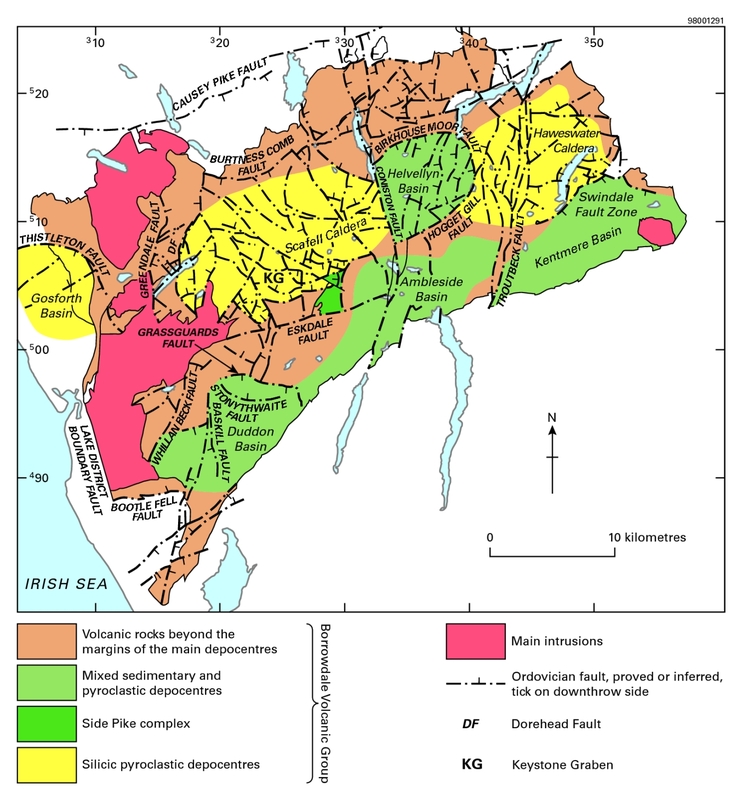 Map of the Borrowdale Volcanic Group showing the main depositional centres and principal faults with displacements inferred to have occurred during accumulation of the volcanic succession. P916045. Bedded tuffs within the Duddon Hall Formation, Duddon valley, showing planar bedding, grading and alternation between coarse and fine layers. These rocks are interpreted as subaerial ash-fall deposits from a phreatoplinian eruption. The hammer is 37 cm long. (P005147). A large, silicic caldera volcano was then built in the Scafell and Langdale areas, centred within the axial region of what is now the Scafell Syncline. The intracaldera succession is preserved, comprising stratified, garnet-bearing, andesitic to rhyolitic pyroclastic rocks, mainly very densely welded ignimbrites (P916049). A complex zone of fault-block rotations helps to define the caldera, at least 15 km across and enclosing a minimum area of 220 km2. It is thought that very much more than 400 km3 of magma were erupted causing piecemeal foundering of the caldera floor as incremental subsidence along growth faults allowed successively erupted units to become ponded within ephemeral, local depressions (P916050). The caldera basin was then progressively filled with sediment. Activity at Scafell began with eruption of andesitic ignimbrite and the succeeding phreatomagmatic tuff of the Whorneyside Formation. Initially, up to about 300 m of welded ignimbrite, the Wet Side Edge Member, buried the pre-existing lava landscape over a wide area from Borrowdale to the Coniston fells (P916050)a. The ignimbrite passes up into bedded fine tuff containing accretionary lapilli, block sags and beds that drape irregular surfaces. More widely dispersed than the ignimbrite and up to about 30 m thick, this large-magnitude phreatoplinian tuff resulted from the ingress of water into the erupting magma. Around Borrowdale, ash fell into shallow lakes where it was reworked by waves and redeposited by turbidity currents and debris flows; here also the deposits were intruded by andesitic sills. Widespread, piecemeal subsidence began at this time, leading to deformation of the ash deposit (P916050)b, whilst the fault-block rotation affecting the Birker Fell Formation in Wasdale and Eskdale is thought to have occurred contemporaneously. Silicic magma was tapped prior to the end of the andesitic phase, resulting in the uppermost part of the Whorneyside Tuff becoming interbedded with silicic tuffs at the base of the Airy’s Bridge Formation. The Long Top Tuff Member comprises welded ignimbrite that is more than 150 m thick on the south side of the caldera. Thickness variations are locally variable and relate to individual volcanotectonic fault blocks (P916050)c. The very intensely welded Oxendale Tuff is ponded at the base of the Long Top Member in the area between Langdale and Seathwaite Tarn. Also, water flooded episodically into the caldera, resulting in widespread phreatomagmatic surge and fall-out tuffs throughout the region and these form marker units within the sequence (P916049). The succeeding very densely welded lapilli-tuffs of the Crinkle Tuff Member (P916050)d represent the climactic phase of the eruption though the Crinkle Tuffs have a more restricted distribution than the Long Top Tuff. In the northern part of the caldera, around Borrowdale, the Crinkle Tuffs are locally up to 650 m thick. The Bad Step Tuff, one of the component units of the Crinkle Tuff Member, is very thin in this area, becoming much thicker to the south in Langdale. Slumping and large-scale fault-scarp failure accompanied caldera collapse. There are only a few examples of tuff-filled dykes and pipes that might represent vent sites for the pyroclastic flows. However, the abundance of very densely welded ignimbrite requires rapid eruption and deposition rates and it seems likely that many of the closely spaced growth faults acted as fissure vents. The climactic eruptions and piecemeal collapse created an irregular topography. Typically, there is an angular discordance of 8 to 15° between these rocks and the overlying Lingmell Formation, with the Crinkle Tuff inclined more steeply towards the centre of the caldera. Volcanic activity that produced the Lingmell Tuffs was much reduced in intensity, and episodic pyroclastic density currents produced an intercalated sequence of thin units of massive lapilli­tuff, breccia and bedded tuff (P916050)e. Unstable fault scarps continued to shed landslides and avalanche deposits locally. Post-collapse magmatism at Scafell included eruption of the Rosthwaite Rhyolite and Scafell Dacite. The former was erupted early in this phase and its intrusive counterpart is also exposed on Rosthwaite Fell (NY 260 120). The later, dacite lava dome straddles a volcano-tectonic fault. Its eruption created significant relief, against which wedge out successive units of the overlying caldera-basin sedimentary fill; lenses of dacite-rich breccia at several levels within the sedimentary pile testify to the episodic shedding of debris into the basin. The sedimentary fill of the caldera basin (Seathwaite Fell Formation) involved fluvial, lacustrine and pyroclastic processes. Throughout, sediment transport was dominantly towards the basin centre. Near the base along the north side of the basin, steep-fronted pebble-gravel deltas were fed from the north-north-west. Thinly bedded units of fine-grained sediment are probably turbidites, locally reworked, but the presence of wave ripples suggests maximum water depths of a few tens of metres. Debris-flow deposits were also contributed and there are intervals dominated by cross-stratified gravel-filled channels. Contemporaneously erupted andesitic tephra was brought in from outside the caldera by sediment gravity-flows. Widespread syndepositional deformation and slumping in these deposits resulted from loading and liquefaction of the sediment, possibly triggered by earthquakes. The Pavey Ark Breccia contains abundant andesite blocks that appear to have been hot and plastic on deposition, and which were sourced from the east. A significant subaerial silicic eruption occurred during the later stages of caldera infill to form the Glaramara Tuff. The tuff, containing abundant accretionary lapilli, becomes thinner and finer grained southwards, and changes in facies from massive in the north, to stratified and cross-stratified, and to massive and bedded in the south. The tuff aggraded from a rapid succession of pyroclastic density currents, produced during phreatomagmatic eruptions, and built a low-relief tuff ring with a vent probably located just north of the present outcrop. From Ullswater to Haweswater the low-profile volcanoes of the Birker Fell Formation were buried beneath another stratified sequence of silicic pyroclastic rocks. Initially, pyroclastic density current deposits accumulated south-east of Ullswater, from Place Fell (NY 415 185) to Riggindale (NY 458 114), to form a 10–340 m-thick sequence of andesitic to dacitic tuff and lapilli-tuff. The overlying Whelter Knotts Formation comprises a 550 m-thick sequence consisting of three silicic units. 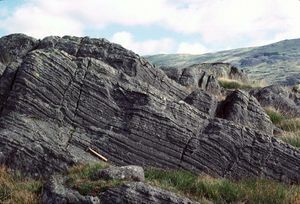 The basal, bedded pyroclastic rocks, which include some of the most garnetiferous rocks seen in the Borrowdale Volcanic Group, are overlain by a flow-foliated felsitic unit, recognised only locally around Haweswater (NY 497 167), and by a succession of massive, eutaxitic, parataxitic and lithic-rich lapilli-tuff facies, locally with intercalations of bedded tuff. Welding varies from weak to very dense, with columnar jointing and rheomorphic fabrics locally developed near the southern part of Haweswater. Near the base of the formation on Kidsty Pike (NY 448 125), are thinly stratified ignimbrites, one unit of which contains abundant siliceous nodules. Though the outcrop of the Haweswater succession is much disrupted by faults, in particular the Troutbeck Fault Zone, there is a broad, basin-like structure, en échelon to the Scafell Caldera (P916045). Across some faults in the Haweswater area, there are abrupt changes in strike of the strata and in thickness and facies in the Whelter Knotts Formation. There is no evidence for a significant break in deposition in this sequence, suggesting that the two formations were probably emplaced during a single, violently explosive eruptive episode accompanying caldera formation in the Haweswater area during the climax of volcanism. Following the climactic eruptions at Scafell, pyroclastic, lava-dominated and volcaniclastic­sedimentary sequences up to 3000 m thick accumulated in the south-west of the Lake District. These were emplaced contemporaneously with the waning phase of pyroclastic activity and basin infill at Scafell. The new focus of activity began with two voluminous pyroclastic eruptions centred near Ulpha (SD 190 130) and these seem to have been the prelude to development of the Duddon Basin, a major depocentre bound to the north by the Grassguards Fault and to the south by the inferred Bootle Fell and Kirkby faults which bound the graben. The first eruption produced the densely welded, andesitic to rhyolitic ignimbrite of the Waberthwaite Tuff Formation, which is ponded to a thickness exceeding 1900 m between the Whillan Beck and Baskill faults (P916045). 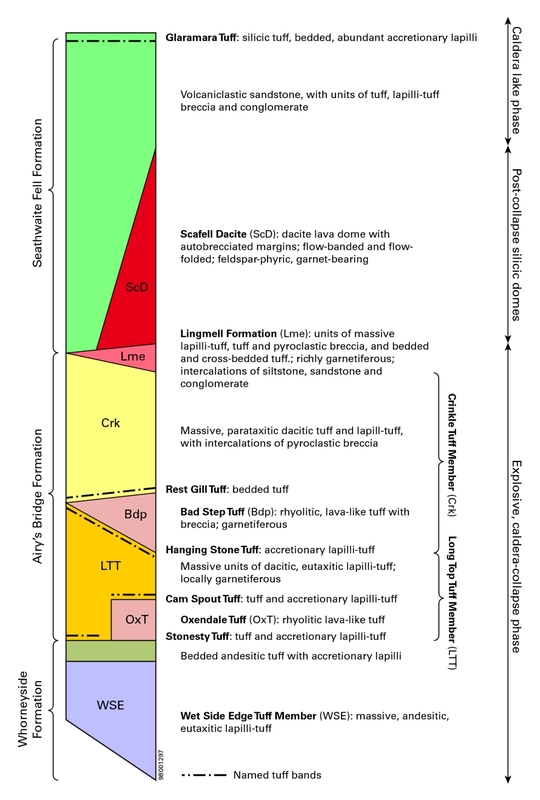 The geometry of the unit, along with features such as abundant rheomorphic fabrics and intercalated units of mesobreccia, suggest accumulation within a caldera. The second eruption followed without a significant time break, depositing andesitic tephra over an area of at least 16 km diameter, from Duddon Bridge to north-east of Wetherlam to form the Duddon Hall Tuff Formation. The tuff is similar to the earlier Whorneyside Tuff and represents another large-magnitude phreatoplinian fall-out tuff (P005147). Ash fall-out was accompanied by pyroclastic density currents which produced units of bedded, vesicular and accretionary lapilli-rich tuff. In the Coniston Fells these are intercalated with massive units of scoria and lithic-rich lapilli-tuff. During the eruption, andesite sills were emplaced around Ulpha Park and Green How (SD 189 915–205 958). Near Ulpha, the phreatoplinian tuff is overlain by grey silty mudstone of the Holehouse Gill Formation. The mudstone contains abundant reworked acritarchs and the mud was probably derived from eroded Skiddaw Group rocks. The lithology and abrupt thinning of the formation away from its area of maximum thickness suggests accumulation within a small, enclosed basin at a time when volcanic sediment was in short supply. The thickest development of mudstone approximately coincides with the thickest development of the underlying bedded tuff lithofacies, suggesting that the former may have been deposited within a caldera produced by the phreatoplinian Duddon Hall eruption. An andesite lava shield volcano was constructed in the north-east of the basin at this time. 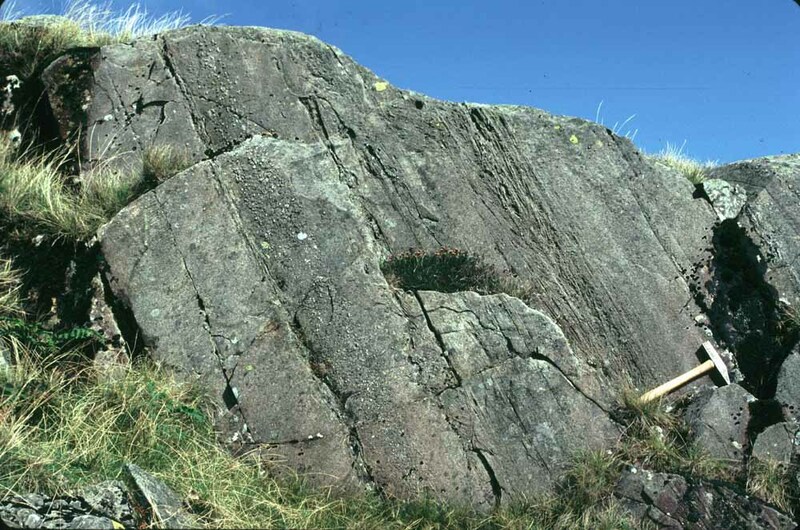 The overlying rocks mark the onset of volcaniclastic sedimentation throughout the Duddon Basin, but this was interrupted episodically by silicic pyroclastic activity. Up to 1200 m of sandstone, breccia and conglomerate are intercalated with sheets of ignimbrite. The sedimentary units thicken markedly towards the axial region of the basin, suggesting that sediment loading and extensional faulting controlled basin development, though facies and thickness changes also relate to the Stonythwaite Fault. 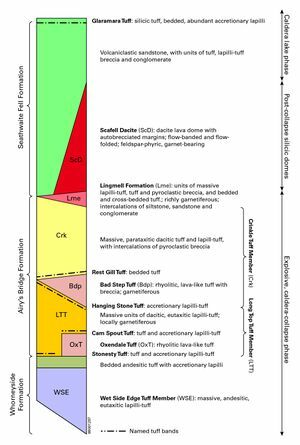 The sedimentary units are rapidly accumulated, coarsening-upwards cycles: turbiditic sandstones dominate the well-bedded lower parts, replaced higher up by increasing volumes of mass-flow deposits. Evidence of fluvial reworking is seen at intervals throughout. Contemporaneous erosion occurred in the Coniston Fells, to the north, and much of the volcaniclastic sediment accumulating in the basin may have been supplied from there. South of the Haweswater Caldera, in the Kentmere and Shap fells, at least 3000 m of volcaniclastic sedimentary and pyroclastic rocks are preserved in a region bounded by the Swindale Fault Zone. The Kentmere succession hosts the largest concentration of mafic sills within the volcanic group. The lowest part of the succession accumulated in a fluviolacustrine environment, with subaqueous sediment fall-out repeatedly interrupted by fluvial activity and the influx of mass-flow deposits. A high proportion of the coarser-grained and conglomeratic upper part of the sequence was deposited from mass flows, which reworked contemporaneously erupted pyroclastic deposits. The instability and rapid accumulation of the sediment pile is shown by the presence of abundant soft-sediment deformation. The extent, facies, thickness and degree of welding in the succeeding andesitic to rhyodacitic ignimbrite sheet resulted from its emplacement during a single, large magnitude, eruption that produced high-density pyroclastic flows; the scale of the event was comparable with those responsible for other large ignimbrites in the Lake District. A welded basal zone, locally with rheomorphic fabrics, passes up into lapilli-tuff characterised by abundant silicic lithic lapilli; the uppermost part is nonwelded coarse tuff. East of the Troutbeck Fault, the ignimbrite is conformably overlain by bedded, andesitic, pyroclastic rocks, which are interpreted as the remains of a Surtseyan tuff-cone field. In Woundale (NY 410 080), the pyroclastic rocks comprise massive to weakly stratified lapilli­tuff, overlain by bedded and cross-bedded tuff. These were all emplaced from pyroclastic density currents, whereas intercalated layers of blocks and bombs, with accompanying sag features, indicate episodic ballistic ejections. Channels and discordances resulted from subaerial erosion and/or slumping. Northwards, these facies are intercalated with units of massive lapilli-tuff which, whilst emplaced from pyroclastic flows, show local evidence for reworking by waves and currents. From Kentmere, east to the Shap Fells, basaltic andesite and subordinate andesite sheets, possibly up to 1200 m thick, overlie the bedded pyroclastic unit. Some of the andesite sheets are sills, but the clinkery autobreccias associated with the basaltic andesite sheets are typical of lavas and the sequence most likely originated as part of a low, shield-like volcano. In the central southern part of the volcanic group outcrop, volcaniclastic sedimentary rocks of the Tilberthwaite Formation within the Ambleside Basin succession overstep the Duddon and Kentmere successions to overlie the Scafell Caldera succession. A marked unconformity at the base is seen locally on the west side of Coniston Old Man (SD 272 975), where sandstone gently oversteps steeply dipping ignimbrite, and at Tilberthwaite (NY 304 014), where sandstone abuts a steep, cliff-like unconformity in ignimbrite. The sandstone succession is about 1100 m thick near Tilberthwaite, thinning northwards to zero in the central fells. A massive landslide deposit, the Side Pike Complex (P916045), lies beneath the Tilberthwaite Formation south of Langdale. Well-bedded, fine-grained rocks form the lowest 150 m of the succession south-west of Coniston. Here, stratified pyroclastic fall-out deposits were extensively reworked by traction currents. The abundance of siltstone beds and intercalations of grey and brown, fine-grained sandstone indicates either suspension fall-out from distal eruptions or quiescent episodes with low sediment input. The overlying rocks comprise massive and thickly bedded coarse-grained or pebbly sandstones (P005139). Weak, diffuse bedding and abundant andesite scoria in some of these beds suggest rapid deposition from voluminous high-density sediment flows generated during pyroclastic eruptions. Some of the scoria was derived from peperitic sills that were emplaced contemporaneously at shallow depths within the sediment pile. Abundant soft-sediment deformation structures attest to rapid subaqueous deposition. A widespread silicic accretionary lapilli-tuff unit emplaced during a phreatomagmatic eruption and a small-volume ignimbrite occur in the uppermost part of this sequence. The stratified succession of silicic ignimbrites within the Lincomb Tarns Formation is the most widespread in the volcanic group. From the size of its outcrop, which encompasses almost 500 km2, it seems likely that the eruptions buried the entire Borrowdale volcanic graben beneath at least 150 m, and locally more than 800 m, of densely welded, dacitic lapilli­tuff. This represents an eruption of exceptional magnitude, during which caldera formation is implicit. The annular form of the Birkhouse Moor and Hogget Gill faults, and the almost flat-lying stratified nature of the Lincomb Tarns ignimbrites within it, may indicate the location of the caldera. From south to north, the ignimbrite sequence oversteps sedimentary rocks of the Ambleside Basin and Scafell Caldera to overlie Birker Fell andesites around the Legburthwaite graben. The character of the basal contact changes systematically (P916051). In the east and south, the ignimbrite rests on an erosion surface cut across the underlying strata; for example, north-east of Coniston, the ignimbrite fills a 140 m deep valley and in Kentmere it drapes up to 250 m of relief. Westwards the contact becomes conformable, a change interpreted as showing that there the ignimbrite was deposited on a low-relief depositional plain. Ultimately, around Broad Crag (NY 216 077), the ignimbrite is brecciated, reworked and interbedded with sandstone where the pyroclastic flows entered a body of water. These relationships indicate a palaeoslope inclined to the west and its existence may be explained by pre-eruption doming across the region as the high-level magma chamber was filled. The eruption began with a sequence of pyroclastic surges, and thin deposits were preserved on the depositional plain. Within the Legburthwaite graben, heterogeneous units of garnetiferous eutaxitic lapilli-tuff, lithic-rich lapilli-tuff and tuff-breccia, at least 280 m thick, accumulated, possibly near to the vent. Densely welded, rheomorphic lapilli-tuff of the Thirlmere Member succeeds the basal rocks in the Legburthwaite graben, Wythburn fells and Helvellyn Basin. Contemporaneous movements on the Birkhouse Moor Fault locally produced a thick development of mesobreccia, whilst slumped masses of lapilli-tuff adjacent to the fault were deformed plastically and sheared whilst they were still hot. More than 300 m of Thirlmere ignimbrite are preserved within the Helvellyn Basin and Legburthwaite graben. 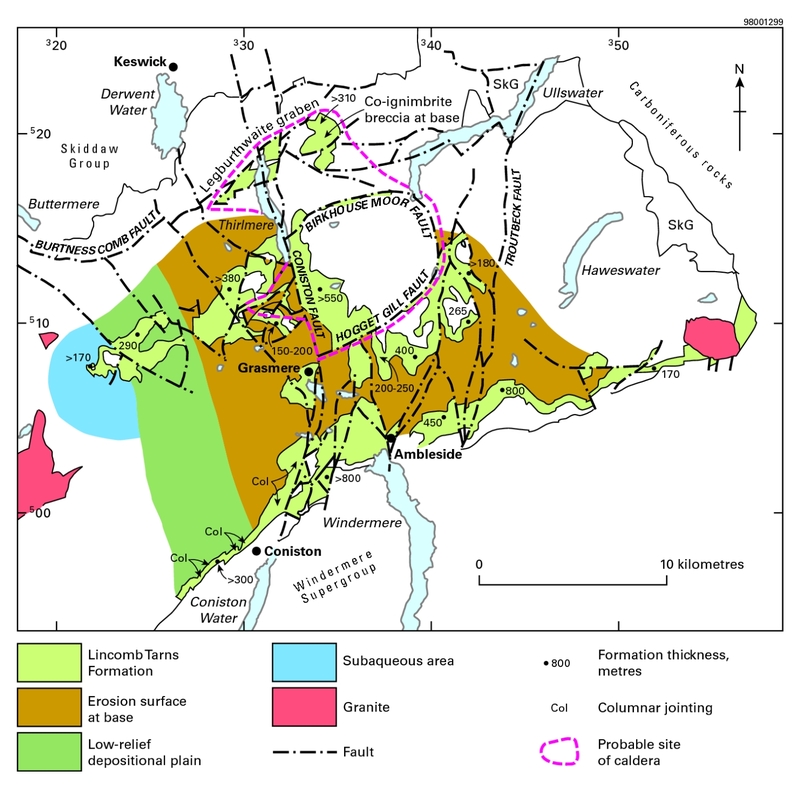 The features of the Thirlmere Member are typically found within caldera-fill successions at ignimbrite volcanoes. In the northern part of the Helvellyn Basin, the Thirlmere Member is succeeded by up to 150 m of massive and bedded fine to coarse tuffs. These rocks seem to represent a period of diminished volcanic activity following the paroxysmal Thirlmere eruption. The overlying heterogeneous sequence of ignimbrites is widely dispersed. South-east from the Helvellyn area, eutaxitic lapilli-tuff passes up into crudely stratified lithic-rich lapilli-tuff, tuff-breccia and breccia. In the south, from Shap to south-west of Coniston, the ignimbrite has a more uniform character and is columnar jointed between Oxen Fell (NY 324 015) and Torver Beck (SD 273 963). Massive lapilli-tuff in the Ullscarf area (NY 291 122) passes westwards, to the Scafell area, into thinner, bedded-flow units. The Lincomb Tarns ignimbrites are succeeded by sedimentary rocks intercalated with some silicic pyroclastic units and lavas. The lower part of the succession extends throughout the central Lake District and beneath the unconformity at the base of the Dent Group. However, the main depocentre appears to have been within the Helvellyn Basin, where at least 1600 m of strata are present. Within the basin, strata progressively steepen south-eastwards across north-east-trending syndepositional faults, thus preserving successively younger beds towards the south-east. In the Scafell area, inundation followed soon after emplacement of the Lincomb Tarns ignimbrite. The uppermost ash deposits were reworked and the succeeding laminated mudstone, siltstone and sandstone were laid down under relatively quiet, subaqueous conditions. Farther east, the sequence is dominated by sandstone containing abundant soft-sediment deformation structures that testify to rapid sediment accumulation. Intercalated lenticular units of pebbly sandstone and breccia, emplaced as mass flows, thicken and coarsen towards major faults; these units represent alluvial fan deposits generated by contemporaneous fault movements. Locally, on Seat Sandal and Fairfield Brow (NY 3498 1172 to 3536 1180), and north­east of Hartsop village (NY 418 136), andesite block-lavas rest on the Lincomb Tarns Formation. These lavas probably represent remnants of small andesite volcanoes. The Middle Dodd Dacite, which was erupted some time later, encompasses numerous isolated outcrops within an area of about 26 km2, both within and beyond the margins of the Helvellyn Basin. Clastic sedimentation in the Helvellyn Basin was interrupted by eruption of voluminous pyroclastic density currents that were ponded to the south of the Birkhouse Moor Fault to form the Helvellyn Tuff. Initially, a rapid succession of pyroclastic flows built up a thick deposit of welded lapilli-tuff but, later in the eruption, large volumes of water episodically entered the vent, producing pyroclastic surge and ash fall-out deposits that were interstratified with continued emplacement of ignimbrite. With a thickness of up to 400 m, the Helvellyn Tuff compares to many of the major Borrowdale Volcanic Group ignimbrites. A return to fluviolacustrine sedimentation occurred with the overlying Deepdale Formation, the base of which ranges across 60 m of topographical relief. Planar-bedded units of massive, normally graded or laminated beds of fine to coarse-grained sandstone make up much of the sequence. These were deposited mainly by turbidity flows, and locally reworked by traction currents. Intercalated lenticular units of coarse-grained sediment within the Deepdale Formation originated as alluvial fan deposits that built up adjacent to the major basin faults. Once again there are abundant soft-state deformation structures. A succession, mainly comprising ignimbrite and at least 1000 m thick, has been proved within a half-graben to the west of the Thistleton Fault in west Cumbria (P916052). The sequence is poorly exposed and information has been mainly obtained from the 9.8 km of cores of volcanic rock recovered from 22 deep boreholes drilled near Gosforth. The base of this sequence has not been proved and the rocks cannot be correlated with those to the east. The succession may contain the youngest volcanic rocks preserved in the Borrowdale Volcanic Group. Units such as the Bleawath Formation, Seascale Hall Member and the Fleming Hall Formation comprise densely welded, dacitic and rhyolitic ignimbrites containing rheomorphic fabrics, together with intercalated lithic co-ignimbrite breccias and breccia formed through fusion of welded tuff blocks. This assemblage suggests that another caldera system was developed in this area. Changes in stratigraphy, lithofacies and thickness between some of the closely sited boreholes resulted from either volcanotectonic faulting or contemporaneous erosion and infill. Higher parts of the succession, proved in a northern group of boreholes, comprise a sequence of rapidly deposited sandstones, overlain by another major silicic ignimbrite, and intruded by andesite sills. Three volcaniclastic formations occur in the Cross Fell Inlier and though the lithofacies present are typical of the upper part of the Borrowdale Volcanic Group, none of the units can be correlated with those in the central Lake District. The silicic ignimbrites of the Knock Pike Formation are some of the most geochemically evolved rocks seen. P916111 Summary of the principal phases in the development of the Borrowdale Volcanic Group. 7 Lincomb Tarns ignimbrite Throughout BVG. 6 Ambleside Basin succession Central south Lake District. Oversteps 5a, b, 4a; bedded volcaniclastic sandstone and breccia; >1100 m Fluviolacustrine sedimentation dominated by catastrophic influx of eruption generated sediment-gravity flows. 5a Duddon Basin succession SW Lake District. 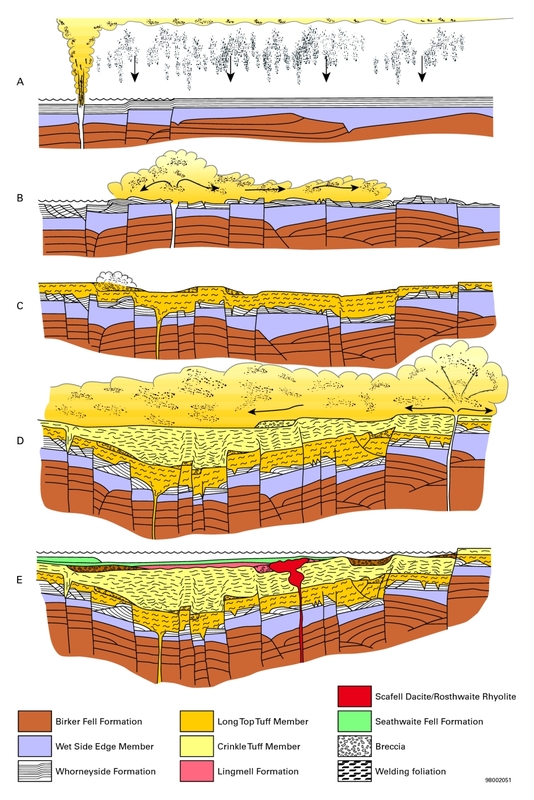 Stratified sequence of volcaniclastic sedimentary rocks, andesitic and rhyolitic pyroclastic rocks and andesite lavas Explosive intermediate ?caldera-related pyroclastic eruptions; succeeded by catastrophic eruption-generated sedimentation in extensional basin, episodically interrupted by emplacement of silicic ignimbrites. Many sills emplaced? Beddoe-Stephens, B, Petterson, M G, Millward, D, and Marriner, G F. 1995. 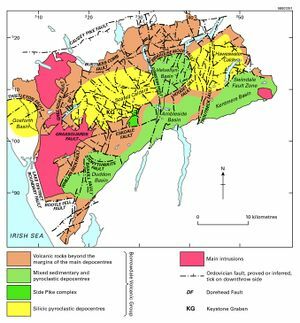 Geochemical variation and magmatic cyclicity within an Ordovician continental-arc volcanic field: the lower Borrowdale Volcanic Group, English Lake District. Journal of Volcanology and Geothermal Research, Vol. 65, 81–110. Branney, M J, and Kokelaar, B P. 1994. Volcanotectonic faulting, soft-state deformation and rheomorphism of tuffs during development of a piecemeal caldera, English Lake District. Geological Society of America Bulletin, Vol. 106, 507–530. Branney, M J, and Soper, N J. 1988. Ordovician volcano-tectonics in the English Lake District. Journal of the Geological Society of London, Vol. 145, 367–376. Branney, M J, and Suthren, R J. 1988. High-level peperitic sills in the English Lake District: distinction from block lavas and implications for Borrowdale Volcanic Group stratigraphy. Geological Journal, Vol. 23, 171–187. Fitton, J G. 1972. The genetic significance of almandine-pyrope phenocrysts in the calcalkaline Borrowdale Volcanic Group, northern England. Contributions to Mineralogy and Petrology, Vol. 36, 231–248. Hughes, R A, Evans, J A, Noble, S R, and Rundle, C C. 1996. 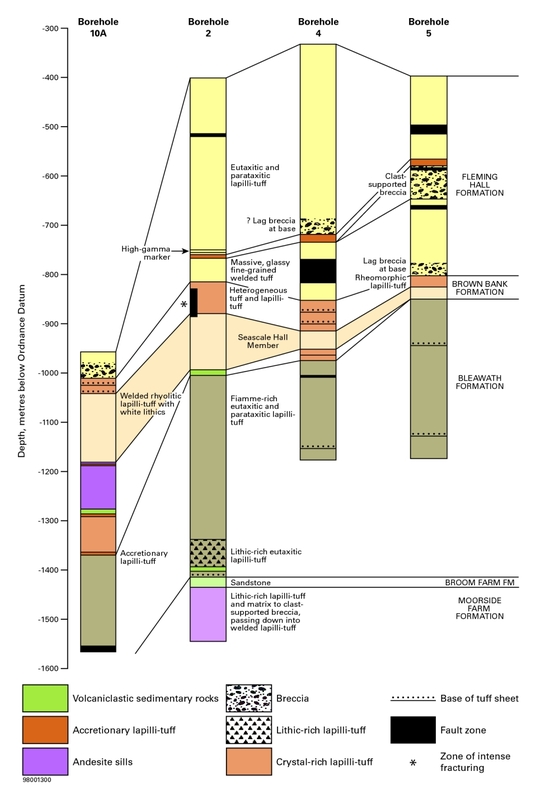 U-Pb chronology of the Ennerdale and Eskdale intrusions supports subvolcanic relationships with the Borrowdale Volcanic Group (Ordovician, English Lake District). Journal of the Geological Society of London, Vol. 153, 33–38. Johnson, E W, Briggs, D E G, Suthren, R J, Wright, J L, and Tunnicliff, S P. 1994. Non-marine arthropod traces from the subaerial Ordovician Borrowdale Volcanic Group, English Lake District. Geological Magazine, Vol. 131, 395–406. Millward, D. 2002. Early Palaeozoic magmatism in the English Lake District. Proceedings of the Yorkshire Geological Society, Vol. 54, 65–93. Millward, D. 2004. The Caradoc volcanoes of the English Lake District. Proceedings of the Yorkshire Geological Society, Vol. 55, 73–105. Millward, D, and Evans, J A. 2003. U-Pb chronology and duration of upper Ordovician magmatism in the English Lake District. Journal of the Geological Society of London, Vol. 160, 773–781. Millward, D, Beddoe-Stephens, B, Williamson, I T, Young, S R, and Petterson, M G. 1994. Lithostratigraphy of a concealed caldera-related ignimbrite sequence within the Borrowdale Volcanic Group of west Cumbria. Proceedings of the Yorkshire Geological Society, Vol. 50, 25–36. Millward, D, Marriner, G F, and Beddoe-Stephens, B. 2000. The Eycott Volcanic Group, an Ordovician continental-margin andesitic suite in the English Lake District. Proceedings of the Yorkshire Geological Society, Vol. 53, 81–96. Petterson, M G, Beddoe-Stephens, B, Millward, D, and Johnson, E W. 1992. A pre-caldera plateau-andesite field in the Borrowdale Volcanic Group of the English Lake District. Journal of the Geological Society of London, Vol. 149, 889–906. Piper, J D A, Stephen, J C, and Branney, M J. 1997. Palaeomagnetism of the Borrowdale and Eycott volcanic groups, English Lake District: primary and secondary magnetisation during a single late Ordovician polarity chron. Geological Magazine, Vol. 134, 481–506. This page was last modified on 5 May 2016, at 15:41.